The objective of the present study was to investigate the metabolic response to prolonged systemic injury in Wistar rats supplemented with Nigella sativa L. (N. sativa) oil and/or saturated fat. Forty-eight animals were divided in to three dietary groups; Rat-Chow (RC), N. sativa oil diet (NSOD) (Combination of 4% N. sativa oil and 16% butter oil) and saturated fat diet (SFD) (20% butter oil) and diets were supplemented for six weeks. At end of the dietary treatments, each group was divided in two groups as control and trauma. The systemic injury induced with three subcutaneous injections of turpentine (2 mL kg-1) in the dorso-lumber region by keeping 48 h intervals between the injections. TNF-α, IL-6, AST, ALT, ACP, ALP, glucose, triglycerides, cholesterol, albumin and total protein concentrations were estimated in serum by using commercially available kits. Nucleic acid (RNA), GSH and MDA levels were estimated in tissues. Mean body and visceral fat weights were significantly increased in SFD fed animals while it found remain unchanged in NSOD fed rats. Serum enzymes, interleukins and lipids levels were significantly elevated in trauma groups, the least increase was found in NSOD fed rats compared SFD fed injured rats. RNA, total proteins and GSH levels decreased and MDA levels increased significantly in SFD fed traumatized rats compared to NSOD fed animals. The results revealed with histopathological evaluation found protective effect of N. sativa oil against the trauma-induced metabolic changes. In conclusion, N. sativa oil is more beneficial for accidental or post-surgical patients. Further studies are required to find out its effects over chronic HFD exposure along with chemically-induce pro-oxidation process. Trauma, a physical injury to the body, a wound, an elective surgery, burns or a bone fracture, draws an inflammatory response from the body of varying magnitude on the extent of tissue damage caused by the traumatizing insult. Trauma triggers a cascade of events starting from neuroendocrine stimulation, the immunologic activation and finally the metabolic changes that result from them (Jackson, 2008). Experimental studies have used diverse methods to induce trauma and to elicit inflammatory responses in animals. Chemical induction of tissue damage is a simpler alternative of inducing injury which can be applied quickly and reproducibly (Van Steeg et al., 2007). Several studies have made use of subcutaneous injections of mineral turpentine to induce trauma in rats. Eckersall et al. (1996) reported that, the mean serum C-reactive protein level increased eight-fold with a peak on the 2nd day after turpentine injection in pigs. In another study, Freeswick et al. (1994) reported that, turpentine-induced sepsis resulted in a three to fourfold rise in plasma levels of the stable end products of nitric oxide production. Wusteman et al. (1995) showed that subcutaneous injection of turpentine induced discrete aseptic abscess in rats without detectable injury to other tissues. Yao et al. (2005) also used this model to study induce acute phase protein in salivary gland. Oxidative stress is caused when the pro-oxidant challenge overwhelms the antioxidant defenses and potentially leads to cellular damage (Sies, 1997). Oxidative stress in the human body is proposed to be involved in the pathophysiology of many chronic human diseases such as atherosclerosis (Gutteridge and Halliwell, 1990), diabetes, kidney disease, (Richelle et al., 1999), cataracts (Basu, 1998), septic shock and possibly to accelerate the aging process (La Feunte and Victor, 2000). The type of fat eaten in the diet may affect the level of oxidative stress. Dietary saturated fats are known to increase plasma concentration of total cholesterol and LDL cholesterol (Ordovas et al., 2007). MacDonald-Wicks and Garg (2002) reported that, dietary fat can modulate lipid peroxidation and antioxidant defenses when exposed to a pro-oxidant challenge. The response of the body to infection of trauma induces marked changes in protein metabolism. There is an overall increase in protein turnover rate, attributed partially to acute-phase protein synthesis in liver and increase liver protein mass. At the some time there is a marked overall lost of body protein originating from skeletal muscle. Maintenance of normal protein synthesis rates in infection and in other catabolic states is not possible since muscle protein synthesis is very sensitive to wide range of insults (Lang et al., 2007). Metabolic response to injury and sepsis: changes in protein metabolism. Amino acids are released from the protein mass as a result of imbalance between protein synthesis and breakdown. Several hypothesis have been put forth to explain the different patterns of muscle protein based to explain the different patterns of muscle protein based on the tissue responses to various stimuli (Biolo et al., 1997). Decreased in muscle protein content and an increase in liver protein content was observed after an intravenous administration of human recombinant TNF-α in rats (Li et al., 2008; Kim et al., 2007). Skeletal muscle protein and RNA content was significant reduced in infected rats as compared to controls three days after inducing thermal injury (Dwarakanath et al., 2004). Nigella sativa Linn. (Ranunculaceae), commonly known as black cumin or black seed, is an erect herbaceous annual plant. Its seeds have shown to contain more than 30% (w/w) of a fixed oil with 85% of total unsaturated fatty acid (Houghton et al., 1995). The experimental studies showed that, N. sativa seeds decreases the serum total lipids and body weight in Psammomys obesus sand rat (Labhal et al., 1997), increase serum total protein (Haq et al., 1995) and shows diuretic and hypotensive effects in spontaneously hypertensive rat (Zaoui et al., 2002). Production of peroxides by enzymatic reaction of arachidonic acid with oxygen is the key step in the biogenesis of physiologically important compounds, e.g., prostaglandin, thrombaxanes, prostacyclines and leukotrienes. Injury induces hydrolysis of membrane bound fatty acids, followed by their transformation to hydroperoxides by lipoxygenases in presence of oxygen (Spiteller, 1993). However, the role played by prostaglandins, leukotrienes and oxygen radicals in inflammation and pain is well documented (Hardman and Limbird, 2001). Thymoquinone is an active ingredient from N. sativa seeds has been shown to be potent inhibitor or eicosanoid generation, namely thromboxane B2 and leucotrienes B4, by inhibiting both cycloozygenase and 5-lipooxygenase enzymes, respectively (Houghton et al., 1995; El-Dakhakhny et al., 2002). This antioxidant property would explain its action against CCl4 hepatotoxicity (Nagi et al., 1999), liver fibrosis and cirrhosis (Turkdogan et al., 2001) and hepatic damage induced by Schistosoma mansoni infection (Mahmoud et al., 2002). Glutathione (GSH), a simple tripeptide, has been shown to play an important role in cellular metabolism and protection of cells against free-radical induced oxidant injury and hence the prevention of tissue integrity (White et al., 1994). This study was undertaken to investigate the effects of N. sativa oil on the metabolic responses to prolonged systemic injury in rats. The present study has been performed at College of Applied Medical Sciences, King Saud University, Riyadh, Saudi Arabia during Jan-Jun, 2007. Animals: Forty-eight male Wistar albino rats of roughly the same age weighing 120-130 g were received from Experimental Animal Care Center, College of Pharmacy, King Saud University, Riyadh. The rats were housed in separate cages and maintained under standard conditions of temperature (23±1°C), humidity (50-55%) and light 12 h light/12 h dark cycle. The animals were acclimatized for a week with free access to rat chow and tap water. Diets were prepared every week, packed in small packs of 500 g and stored in refrigerator. After the adjustment period, the rats were divided into 3 groups (12 rats in each group) and fed with RC, HFD and NSOD for six consecutive weeks. Individual body weights were recorded every week on Saturday morning. Systemic injury: The method employed was a simple reproducible model of systemic injury which can be induced quickly in a series of three subcutaneous injection of turpentine (2 mL kg-1 b.wt.) into separate sites in the dorso-lumber region, two lateral and one (the last) situated in midline (Wusteman et al., 1994) at 48 h intervals. This model causes a sterile abscess, stops growth and induces an acute-phase inflammatory response over a 6-8 days period (Moshage and Jansses, 1987; Myers and Fleck, 1988). The turpentine injected (traumatized) groups and their respective controls were fasted overnight, anaesthetized with diethyl ether (48 h after the last turpentine injection) and blood samples collected through cardiac puncture. Immediately the organs (liver, heart, kidneys, spleen, visceral fat pads and gastrocnemius muscles) were dissected weighed them separately and organ weights were calculated as g/100 g body weight. 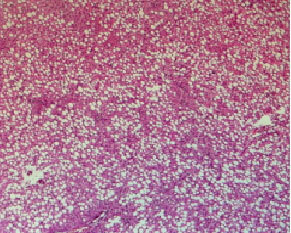 Part of liver samples was preserve in 10% formalin solution for histopathological evaluation. The remaining liver samples and gastrocnemius muscles were dipped in liquid nitrogen for a minute and stored at -70°C till analysis. Blood samples were centrifuged at 5000 rpm for 10 min and serum samples were stored at -20°C till analysis. Laboratory procedures and analysis of serum samples: Standard methods were employed for all the measurements in serum and tissues. Aspartate aminotransferase (AST), alanine aminotransferase (ALT), acid phosphatase (ACP), alkaline phosphatase (ALP), glucose, triglycerides, cholesterol, albumin and total proteins concentrations were estimated in serum by using commercially available diagnostic kits (Randox diagnostic reagents, Randox Laboratories, USA). Serum insulin levels were measured by immunoenzymatic calorimetric method based on ELISA. The protocol used was according to the methods described for the kit (DIA. METRA, Italy). Serum TNF-α concentration was estimated by using the CYTELISA rat TNF- α obtained from CYTIMMUNE Sciences Inc., Maryland, USA. All samples were assayed in duplicate. The intra assay variation was 6.7%. To avoid inter assay variation all samples were run at one time. Optical density of each well was determined by using a microplate reader (Thermo Labsystems, Finland). Serum IL-6 was estimated by using the ELISA Quantikine rat IL-6 immunoassay kit obtained from R and D Systems Inc., Minneapolis, MN, USA. The samples were assayed in duplicate. The intra assay variation was 5.5%. To avoid inter assay variation all samples were run at one time. Optical density of each well was determined by using a microplate reader (Thermo Labsystems, Finland). Estimation of total proteins and RNA levels in tissues: Total proteins in liver and gastrocnemius muscle homogenates (25%, w/v) were measured by folin-phenol reagent after rediluting (1:9 v/v) the homogenates with double distilled water following the method of Lowry et al. (1951). Nucleic acids (RNA) were measured following the method of Bregman (1983). Frozen tissues were homogenized with 4 volumes of ice cold distilled water. The homogenates were suspended in ice-cold trichloroacetic acid (TCA). After centrifugation, the pellet was extracted with ethanol. Quantification of RNA, the nucleic acid extract was treated with orcinol reagent and the green color was read at 660 nm. Standard curve was used to determine the amounts of RNA present in tissues. Total protein and RNA concentrations were calculated as μg and mg per 100 mg wet tissues, respectively. Estimation of glutathione (GSH) levels in tissues: Glutathione concentration was assayed using the method of Sedlak and Lindsay (1968). A cross sectional piece of liver and gastrocnemius muscle tissues were homogenized in ice-cold 0.02 M ethylenediaminetetraacetic acid (EDTA). Aliquots of 0.5 mL of the tissue homogenates were mixed with 0.2 M Tris buffer, pH 8.2 and 0.1 mL of 0.01 M Ellman`s reagent, [5,5`-dithiobis-(2-nitro-benzoic acid)] (DTNB). Tubes were centrifuged at 3000 g at room temperature for 15 min. The absorbance of the clear supernatants was read in a spectrophotometer at 412 mμ in 1 cm quarts cells. The concentrations were estimated by using the standard curve. Estimation of malondialdehyde (MDA) levels in tissues: The method described by Ohkawa et al. (1979) was used. MDA was measured as an indicator of lipid peroxidation. Liver and gastrocnemius muscle tissues were homogenized in KCl solution and incubated with thiobarbituric acid. After centrifugation the pink clear layer was read at 532 nm. Malondialdehyde bis (dimethyl acetal) was used as an external standard. Histopathological assessment: The liver samples preserved in 10% natural buffered formalin and processed for routine paraffin block preparation. Using an American optical rotary microtome, sections of thickness about 3 μm were cut and stained with hematoxyline and eosin (Culling, 1974). The slides were then examined under a microscope for pathomorphological changes as congestion, hemorrhage, edema, erosions and fatty bodies using an arbitrary scale for the assessment of severity of these changes. Saturated fat feedings, significantly (p<0.001) increased the body weights within a week compared to rat-chow fed animals. Whereas, N. sativa oil supplementation delayed the significant increase till 3- weeks (Fig. 1). Effect of dietary fats on body composition of normal and traumatized rats was showed in Table 1. Turpentine-induced trauma significantly increased the liver, kidney and spleen weights in RC and HFD fed rats compared to their respective group of controls. However, such trauma effect was found significantly less in NSOD supplemented rats. Mean weight of visceral fats was significantly increased in HFD fed animals compared to RC and NSOD fed rats. In N. sativa oil diet fed rats the weight of fat pads was not significantly altered as compared to controls. Injury increased the serum AST and ALT levels in all dietary groups significantly compared to their respective controls (Table 2). In N. sativa oil diet fed trauma animals the enzymes were increased compared to controls but these levels found significantly less than SFD fed traumatized rats. Trauma also increased the serum ACP and ALP levels, although those were significantly less in NSOD group compared to SFD fed rats. Trauma caused significant (p<0.001) increase in serum TNF-α and IL-6 levels in all dietary groups. N. sativa oil found protection in the interleukins increased levels that caused by trauma while compared to rat-chow and butter oil diet fed traumatized rats (Table 2). Three turpentine injections significantly increased the fasting serum glucose and insulin levels in RC and HFD fed animals as compared to their respective controls. N. sativa oil showed hypoglycemic effect against the glucose increase induced by the injury and found glucose values significantly lesser than the trauma HFD group (Table 3). Butter oil diet supplementation for 6 weeks caused significant (p<0.05) increase in serum triglycerides and cholesterol levels compared to the rat-chow fed rats. Injury caused significant increase the serum triglycerides levels significantly (p<0.05) in RC and HFD fed rats. N. sativa oil showed hypolipidimic effect against the increase in lipid profile (Table 3). In contrast, injury caused significant decrease in serum total proteins and albumin levels. In NSOD fed rats the trauma effect was minimal so that the total protein and albumin levels remain unchanged (Table 3). Turpentine-induced trauma decreased the protein concentrations significantly in liver and gastrocnemius muscle tissues compared to their respective controls. Such decrease was found less in NSOD fed rats compared HFD fed animals. Similar decrease was seen in RNA levels after turpentine-induced trauma. However, N. sativa oil found reduced the trauma effect in both the tissues compared to saturated fat (Table 4). Lipid peroxidation marker, MDA significantly elevated by the turpentine-induced trauma in all dietary groups compared to their respective controls and in contrast the GSH levels were significantly decreased in tissues of traumatized rats. However, the oxidative stress induced by the trauma was found significantly lesser in N. sativa oil supplemented rats compared to SFD fed animals (Table 5). 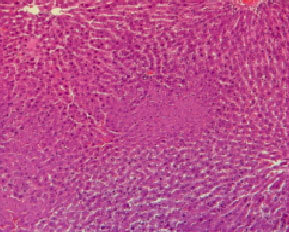 Histopathological evaluation in liver of normal and injured rats showed in Fig. 2-7. 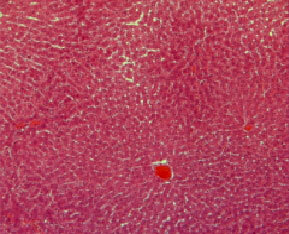 The slide from liver of non-traumatized rat (Fig. 2) in control (rat-chow fed) group showed normal configuration. Three turpentine injections to control rat (Fig. 3) induced changes in liver including mild necrosis, inflammation and degeneration in the hepatocytes. Saturated fat diet supplementation for 6 weeks (Fig. 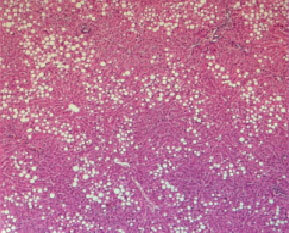 4) showed fatty bodies in liver. Trauma showed visible changed in liver as necrosis, congestion and inflammation in rat supplemented SFD for 6 weeks (Fig. 5). N. sativa oil diet supplementation to normal rats (Fig. 6) for six weeks showed lesser fat deposition in liver than the rats in SFD fed group. Injury caused with turpentine injections to rats fed with N. sativa oil diet showed mild congestion in liver (Fig. 7). In the present study, body weight and visceral fats of 20% saturated fat supplemented rats significantly increased compared to the controls. These results are in agreement with our earlier studies that, 20% butter oil diet significantly increased the body weights and fat pads (Alsaif, 2004; Alsaif and Duwaihy, 2004; Alsaif, 2008). 4% N. sativa oil combined with 16% butter oil diet delayed the body weight increase from week 1 to 3 and decrease in visceral fats compared to SFD fed rats attributed its sliming property. Zaoui et al. (2002) reported that, N. sativa oil (2 mL kg-1 b.wt.) treatment to mice for six weeks significantly reduced the body weights compared to normal mice. The pattern of body weight and visceral fats loss observed in the present study are in line with earlier findings in turpentine induced trauma (Wusteman et al., 1990; Jennings et al., 1992) and in endotoxemia (Jepson et al., 1986). The present results showed significant increase in liver, kidney and spleen weights of traumatized rats are in agreement with earlier studies that have been shown significant increase in liver weight of turpentine injected rats (Wusteman et al., 1994). SFD feedings enhanced the trauma affect on kidney and spleen weights while NSOD showed protection against such increase. Mulrooney and Grimble (1993) reported that, TNF-α induced inflammation caused significant increase in liver, lung and kidney weights in rats fed corn oil, coconut oil, butter oil and fish oil diets. The effect of N. sativa oil on trauma attributed to its anti-inflammatory properties (Hajhashemi et al., 2004; Al-Ghamdi, 2001). Present study showed that turpentine-injections trauma induced hepatocellular injury as evidenced by increased serum enzyme levels (Ajith et al., 2007). SFD worsen the trauma effect by increasing more serum AST and ALT concentrations while NSOD decreased the elevated enzymes that increased from the injury. El-Dakhakhny et al. (2000) reported that, daily administration of N. sativa oil (800 mg kg-1) for 4 weeks did not adversely effect the serum AST, ALT and ALP levels in normal rats and they found 4 weeks prior treatment to induction of hepatotoxicity by d-galactosamine or carbon tetrachloride, it was able to give complete protection against d-galactosamine and partial protection against CCl4 hepatotoxicity. In another study, Al-Ghamdi (2003) reported that N. sativa seeds are safe and protective against CCl4-induced hepatotoxicity. In a general sense, local injury and inflammation are accompanied by acute-phase response (APR), which is characterized by systemic leukocyte mobilization, fever and changes in serum levels of glucocorticoids, cytokines and liver-derived acute phase proteins (Gabay and Kushner, 1999). Inflammatory cells infiltrating the area of injury are known to be recruited from the blood by chemokine mediators released at the site of injury (Baggiolini et al., 1989). In turn, inflammatory cells are responsible for production of cytokines, specifically, the major acute-phase mediators (IL-6, IL-1β, TNF-α and interferon-γ), which are release into the blood (Ramadore et al., 1988, 1990) and can act distantly on intact organs, predominantly on the liver (Tron et al., 2005). In the present study, turpentine-induced trauma increased serum TNF-α and IL-6 concentrations. N. sativa oil significantly reduced the trauma-induced increase in TNF-α and IL-6 levels that attributed its anti-inflammatory properties (Al-Ghamdi, 2001; Hajhashemi et al., 2004). El- Gazzar et al. (2006) reported that, thymoquinone an active ingredient of N. sativa attenuates the proinflammatory response in LPS-stimulated mast cells by modulating nuclear transactivation of NF-κB and TNF-α production. It is well known that sever trauma increases the glucose and insulin levels (Chen et al., 2007; Strommer et al., 2002), present study showed the similar results. Pre-treatment with NSOD showed hypoglycemic effect against hyperglycemia-induced by turpentine injections. Al-Hader et al. (1993) reported that, N. sativa oil showed protection against experimentally induced diabetes in animals. Several reports showed that, saturated fat supplementation increases the serum lipid levels (Kim et al., 2004; Choudhary et al., 2005; Devi and Sharma, 2004), in present study, similar results were found with 20% butter oil diet on serum triglycerides and cholesterol levels. Trauma further increased the serum triglycerides in SFD fed group while NSOD fed rats showed protection against lipids increase. Settaf et al. (2001) reported that, volatile oil of N. sativa is as efficient as the cholesterol-reducing drug simvastatin. The Moroccan group also showed that a daily gavage with a hexane extract of Nigella sativa seeds in Wistar rats for 12 weeks reduced serum cholesterol levels (Zaoui et al., 2002). Serum concentrations of both total proteins and albumin fell as a result of prolonged systemic injury in rats. In both parameters, the fall was greatest in the butter oil and the least in the N. sativa oil groups. These results are supported by previous studies on turpentine induced injury as well as the results from other studies on clinically induced inflammations. In catabolic states, as in severe injury the circulating albumin levels decrease, partly as a result of reduced synthesis and possibly through increased catabolism. Although the site of its catabolism in not clearly known, there is evidence that of albumin breakdown occurs in peripheral tissue (Li et al., 1995). A single insult of turpentine caused a 20% fall in albumin levels 6 h after the injection (Wusteman et al., 1990), while persistent decrease (45%) in plasma albumin levels resulted from a more extended injury 3 turpentine injections (Wusteman et al., 1994). Both trauma and sepsis cause profound alterations in protein metabolism in many organs of the body. Abnormalities of both protein synthesis and degradation have been described in muscles during sepsis (Cary and Guan, 1999). The mediators responsible for the changes in protein synthesis during sepsis most likely involve the overproduction of proinflammatory cytokines, TNFα and IL-6. In this regard, a diminution of protein synthesis in gastrocnemius is observed after acute or chronic trauma suggesting that IL-1 plays a role in the trauma-induced inhibition in protein synthesis in muscle (Cooney et al., 1999). N. sativa oil diet increased the levels of that decreased by turpentine injections. In our recent study, (Alsaif, 2007) thymoquinone protected the ethanol-induced decrease in hepatic total protein levels. Turpentine-induced trauma significantly increased the RNA levels of tissues in present study. 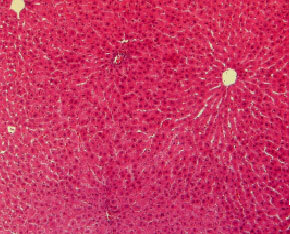 The mechanism responsible for augmented hepatic RNA during trauma has not been elucidated. Several reports have shown that infusion of TNF-α also results in an elevated RNA content in liver (Charters and Grimble, 1989; Cooney et al., 2000). Enhanced rates of RNA synthesis in liver nucleoli isolated from rats 12 and 24 h after turpentine treatment were reported. In the present study, as indication by the changes in glutathione and malondialdehyde levels turpentine induced injury increased the oxidative stress in liver and skeletal muscle of the rats in all the dietary groups. N. sativa oil diet reduced to oxidative stress-induced by turpentine as compared to butter oil diet fed rats. Cellular concentrations of GSH have been shown to inversely correlate with the degree of cell lipid peroxidation while increased tissue malondialdehyde levels implicate that available antioxidants were inadequate to avoid lipid peroxidation (Garrido et al., 1993). Mean MDA levels in both liver and gastrocnemius muscle increased in all injury groups compared to respective controls indicating increased lipid peroxidation. MDA levels were shown to increase 3-fold after a burn injury in sheep (Daryani et al., 1990). Effect of N. sativa seen in the present study against oxidation induced by turpentine attributed to its antioxidative properties. Al-Ghamdi (2003) reported that N. sativa seeds have antioxidant characteristic showing the protection against CCl4-induced hepatotoxicity. Another study, Mahmoud et al. (2002) concluded that, N. sativa oil has immunomo-dilatory effect against Schistosoma mansoni infections in mice. The results are revealed with histopathological evaluation found protective effect of N. sativa oil against injury-induced with turpentine injections. Furthermore, our results are in agreement with earlier reports that, N. sativa has beneficial effect against oxidative stress-induced wither via high-fat-diet feeding or ischemic pro-oxidation. Further studies are required to find out its effects over chronic high-fat-diet exposure along with chemically-induce pro-oxidation process. This study was part of a research funded by King Abdulaziz City for Science and Technology, Riyadh, Kingdom of Saudi Arabia; Grant No. MS-4-11. Ajith, T.A., U. Hema and M.S. Ahwathy, 2007. Zingiber officinale Roscoe Prevents acetaminophen-induced acute hepatotoxicity by enhancing hepatic antioxidant status. Food Chem. Toxicol., 45: 2267-2272. Al-Ghamdi, M.S., 2001. The anti-inflammatory, analgesic and antipyretic activity of Nigella sativa. J. Ethnopharmacol., 76: 45-48. Al-Ghamdi, M.S., 2003. Protective effect of Nigella sativa seeds against carbon tetrachloride-induced liver damage. Am. J. Chin. Med., 31: 721-728. Al-Hader, A., M. Aqel and Z. Hasan, 1993. Hypoglycemic effects of the volatile oil of Nigella sativa seeds. Int. J. Pharmacol., 31: 96-100. Ali, B.H. and G. Blunden, 2003. Pharmacological and toxicological properties of Nigella sativa. Phytother. Res., 17: 299-305. Alsaif, M.A. and M.M.S. Duwaihy, 2004. Influence of dietary fat quantity and composition on glucose tolerance and insulin sensitivity in rats. Nut. Res., 24: 417-425. Alsaif, M.A., 2004. Effect of dietary fats on glucose tolerance, insulin sensitivity and membrane free fatty acid in rats. Pak. J. Nutr., 3: 56-63. Alsaif, M.A., 2007. Effect of thymoquinone on ethanol-induced hepatotoxicity in Wistar rats. J. Med. Sci., 7: 1164-1170. Baggiolini, M., A. Walz and S.L. Kunkel, 1989. Neutrophil-activating peptide-1/interleukin 8, a novel cytokine that activates neutrophils. J. Clin. Invest., 84: 1045-1049. Basu, S., 1998. Radioimmunoassay of 8-iso prostaglandin F2α: An index of oxidative injury via free radical catalysed lipid peroxidation. Essentiol Fatty Acids, 58: 319-325. Biolo, G., G. Toigo, B. Ciocchi, R. Situlin, F. Iscra, A. Gullo and G. Guarnieri, 1997. Metabolic response to injury and sepsis: Changes in protein metabolism. Nutrure, 13: 52S-57S. Bregman, A.A., 1983. Laboratory Investigation and Cell Biology. John Wiley and Sons, New York, USA., ISBN-10: 047186241X, pp: 51-60. Cary, L.A. and J.L. Guan, 1999. Focal adhesion kinase in integrin-mediated signaling. Front Biosci., 4: D102-D113. Charters, Y. and R.F. Grimble, 1989. Effect of recombinant human tumour necrosis factor alpha on protein synthesis in liver, skeletal muscle and skin of rats. Biochem. J., 258: 493-497. Chen, XL, Z.F. Xia, D.F. Ben, J.G. Tian and D. Wei, 2007. Insulin resistance following thermal injury: An animal study. Burns, 33: 480-483. Choudhary, M.I., S. Naheed, S. Jalil, J.M. Alam and Atta-ur-Rahman, 2005. Effect of ethanolic extract of Iris germanica on lipid profile of rats fed on a high-fat diet. J. Ethnopharmacol., 98: 217-220. Cooney, R.N., G.O. Maish, and G.T. Gilpin et al., 1999. Mechanism of IL-1 induced inhibition of protein synthesis in skeletal muscle. Shock, 11: 235-241. Cooney, R.N., S.R. Kimball and G.O. Maish et al., 2000. Effects of TNF binding protein on hepatic protein synthesis during chronic sepsis. J. Surg. Res., 93: 257-264. Culling, C.F.A., 1974. Handbook of Histopathological and Histochemical Techniques. 3rd Edn., Butterworth-Heinemann, London, UK., ISBN-13: 9780407729018, Pages: 712. Daryani, R., C. LaLonde and D. Shu et al., 1990. Effect of endotoxin and a burn injury on lung and liver lipid peroxidation and catalase activity. J. Trauma., 30: 1330-1334. Devi, R. and D.K. Sharma, 2004. Hypolipidemic effect of different extracts of Clerodendron colebrookianum Walp in normal and high-fat diet fed rats. J. Ethnopharmacol., 90: 63-68. Dwarakanath, R.S., S. Sahar, M.A. Reddy, D. Castanotto, J.J. Rossi and R. Natarajan, 2004. Regulation of monocyte chemoattractant protein-1 by the oxidized lipid, 13-hydroperoxyoctadecadienoic acid, in vascular smooth muscle cells via nuclear factor-kappa B (NF-κB). J. Mol. Cell Cadiol., 36: 585-595. Eckersall, P.D., P.K. Saini and C. McComb, 1996. The acute phase response of acid soluble glycoprotein, α(1)-acid glycoprotein, ceruloplasmin, haptoglobin and C-reactive protein, in the pig. Vet. Immunol. Immunopathol., 51: 377-385. El Gazzar, M., R. El Mezayen, J.C. Marecki, M.R. Nicolls, A. Canastar and S.C. Dreskin, 2006. Anti-inflammatory effect of thymoquinone in a mouse model of allergic lung inflammation. Int. Immunopharmacol., 6: 1135-1142. El-Dakhakhny, M., N.I. Mady and M.A. Halim, 2000. Nigella sativa L. oil protects against induced hepatotoxicity and improves serum lipid profile in rats. Arzneimittelforschung, 50: 832-836. Freeswick, P.D., Y. Wan, D.A. Geller, A.K. Nussler and T.R. Billiar, 1994. 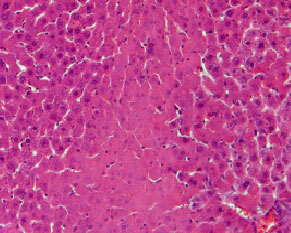 Remote tissue injury primes hepatocytes for nitric oxide synthesis. J. Surg. Res., 57: 205-209. Gabay, C. and I. Kushner, 1999. Acute-phase proteins and other systemic responses to inflammation. N. Engl. J. Med., 340: 448-454. Garrido, A., M. Garate and A. Valenzuela, 1993. Changes in the antioxidant capacity of blood plasma are produced after the ingestion of high doses of fish oil. Res. Comm. Chem. Path. Pharmacol., 82: 367-370. Gutteridge, J.M. and B. Halliwell, 1990. Reoxygenation injury and antioxidant protection: A tale of two paradoxes. Arch. Biochem. Biophys., 283: 223-226. Hajhashemi, V., A. Ghannadi and H. Jafarabadi, 2004. Black cumin seed essential oil, as a potent analgesic and antiinﬂammatory drug. Phytother. Res., 18: 195-199. Haq, A., M. Abdullatif, P. Labo, K. Khabar, K. Sheth and S. Al-Sedairy, 1995. Nigella sativa: Effect on human lymphocytes and polymorphornuclear leucocyte phagocytic activity. Immunopharmacology, 30: 147-155. Hardman, J.G. and L.E. Limbird, 2001. Goodman and Gilman’s the Pharmacological Basis to Therapeutics. 10th Edn., McGraw-Hill, New York. Houghton, P.J., R. Zarka, B. de las Heras and J.R.S. Hoult, 1995. Fixed oil of Nigella sativa and derived thymoquinone inhibit eicosanoid generation in leukocytes and membrane lipid peroxidation. Planta Med., 61: 33-36. Jackson, M.J., 2008. Free radicals generated by contracting muscle: By-products of metabolism or key regulators of muscle function. Free Radic. Biol., Med., 44: 132-141. Jennings, G., A.M. Cruickshank, A. Shenkin, D.G. Wight and M. Elia, 1992. Effect of aseptic abscesses in protein-deficient rats on the relationship between interleukin-6 and the acute-phase protein, alpha 2-macroglobulin. Clin. Sci. (Lond), 83: 731-735. Jepson, M.M., J.M. Pell, P.C. Bates and D.J. Millward, 1986. The effects of endotoxaemia on protein metabolism in skeletal muscle and liver of fed and fasted rats. Biochem. J., 235: 329-336. Kim, H.M., S.J. Bae, D.W. Kim, B.K. Kim and S.B. Lee et al., 2007. Inhibitory role of magnolol on proliferative capacity and matrix metalloproteinase-9 expression inTNF-α-induced vascular smooth muscle cells. Int. Immunopharacol., 7: 1083-1091. Kim, S.O., S.J. Yun and B.J. Eunjoo et al., 2004. Hypolipidemic effects of crude extract of adlay seed (Coix lachrymajobi var. mayuyen) in obesity rat fed high fat diet: Relations of TNF-α and leptin mRNA expressions and serum lipid levels. Life Sci., 75: 1391-1404. La Feunte, M.D. and V.M. Victor, 2000. Anti-oxidants as modulators of immune function. Immunol. Cell Biol., 78: 49-54. Labhal, A., A. Settaf, N. Bennani-Kabchi, Y. Cherrah, A. Slaoui and M. Hassar, 1997. Action anti-obesite, hypocholesterolemiante et hypotrglyceridemiante de Nigella sativa chez le Psammomys obesus. Caducee, 27: 26-28. Lang, C.H., R.A. Frost and T.C. Vary, 2007. Regulation of muscle protein synthesis during sepsis and inflammation. Am. J. Physiol. Endocrinol. Netab., 293: E453-E459. Li, X.Y., C. Zhang, H. Wang, Y.L. Ji ans S.F. Wang et al., 2008. Tumor necrosis factor alpha partially contributes to lipopolysaccharide-induced downregulation of CYP3A in fetal liver: Its repression by a low dose LPS pretreatment. Toxicol. Lett., 179: 71-77. Li, X.Y., K. Donaldson, D. Brown and W. MacNee, 1995. The role of tumor necrosis factor in increased airspace epithelial permeability in acute lung inflammation. Am. J. Respir. Cell Mol. Biol., 13: 185-195. MacDonald-Wicks, L.K. and M.L. Garg, 2002. Modulation of carbon tetrachloride-induced oxidative stress by dietary fat in rats. J. Nutr. Bioch., 13: 87-95. Mahmoud, M.R., H.S. El-Abhar and S. Saleh, 2002. The effect of Nigella sativa oil against the liver damage induced by Schistosoma mansoni infection in mice. J. Ethnopharmacol., 79: 1-11. Moshage, H.J. and J.A.M. Jansses, 1987. Study of the molecular mechanism of decreased liver synthesis of albumin in inflammation. J. Clin. Invest., 79: 1635-1641. Mulrooney, M.H. and R.F. Grimble, 1993. Influence of butter and of corn, coconut and fish oils on the effects of recombinant human tumour necrosis factor-α in rats. Clin. Sci., 84: 105-112. Myers, M.A. and A. Fleck, 1988. Observations on the delay in onset of the acute phase protein response. Br. J. Ent. Pathol., 69: 169-176. Nagi, M.N., K. Alam, O.A. Badary, O.A. Al-Shabanah, H.A. Al-Sawaf, A.M. Al-Bekairi, 1999. Thymoquinone protects against carbon tetrachloride hepatotoxicity in mice via an antioxidant mechanism. IUBMB Life, 47: 153-159. Ordovas, J.M., J. Kaput and D. Corella, 2007. Nutrition in the genomics area: Cardiovascular disease risk and the Mediterranean diet. Mol. Nutr. Food Res., 51: 1293-1299. Piccoletti, R., M. Aletti and A. Bernelli-Zazzera, 1986. Inflammation associated events in liner nucler during acute phase reaction. Inflammation, 10: 109-117. Ramadore, G., J. Van Damme and H. Rieder, M.K.H. Zum-Buschenfelde, 1988. Interleukin 6, the thired mediator of acute-phase reaction, modulates hepatic protein synthesis in human and mouse. Comparison with interleukin 1 beta and tumor necrosis factor-alpha. Eur. J. Immunol., 18: 1259-1264.